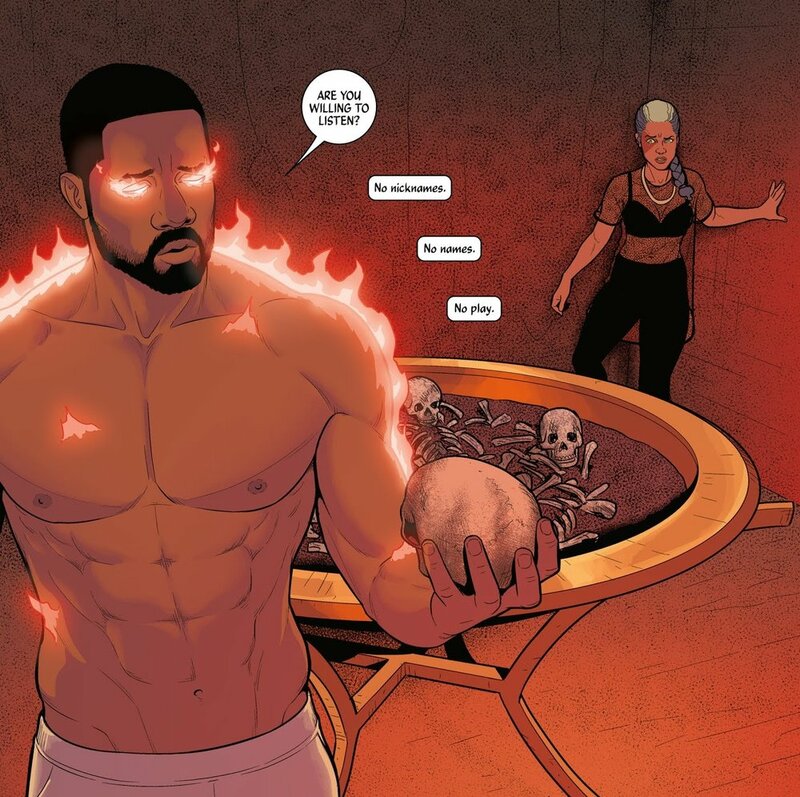 The Wicked + The Divine #36, by Kieron Gillen, Jamie McKelvie, Matthew Wilson, and Clayton Cowles, reveals Baal’s terrible secret. Will Persephone survive knowing it or can she use her own trump card to convince Baal not to kill her? Six thousand years ago, Ananke greets the first Persephone and kills her. This echoes through all the Recurrences, with Ananke alternately killing Persephone or greeting her. After this, the story picks up where the last issue left off. Persephone is in Baal’s secret room with him and he explains to her the why of his grisly secret. Ananke told him that the Darkness would periodically come and that they needed to make a sacrifice every time to keep it at bay until they could find a ritual to keep it away for good. The Darkness came and attacked Baal’s family, killing his father, and he was forced to go through with the horrible thing that Ananke told him would keep it at bay. Since gaining his powers, he’s done it every four months. It seems like Baal is about to kill Persephone before she can reveal his secret, but Persephone has a secret of her own, one that convinces Baal to spare her. The book’s opening sequence is both a marvel of storytelling and an annoyance. First off, the amount of research it took to get the details right for six thousand years of human fashion must have been quite daunting. Secondly, it shows the evolution of Ananke. In nearly every Recurrence, Persephone is a hidden god, a sacrifice Ananke makes that none of the others know about. This sequence shows all the different ways Ananke tried to deal with Persephone over the years, even showing that sometimes Persephone got the upper hand. It’s annoying, though, because of how much page real estate is takes up. Readers come into this issue hoping to get answers about the big cliffhanger, but it gets delayed by this sequence. However, between the impact this has on the narrative and the amount of effort put into, this sequence is definitely a standout for the series. The second half of the issue more than makes up for any annoyance that the first half might have left readers with. It shows that Baal is willing to do terrible things to hold the Great Darkness at bay and that he knows more about what is going with the Recurrences than he’s let on to the others. He feels no regret over what he’s done; he’s willing to do anything to stop the Darkness and save his family. He does realize how others will look at his actions, and is willing to kill Persephone to keep her quiet. Persephone’s own secret is a huge bombshell for him, making him change his mind about killing her, while also raising another question about the ritual that might stop the Darkness. As far as he’s gone to stop it, would he go that far? Again, Wic+Div answers questions and leaves readers with all new ones. McKelvie makes a lot of interesting artistic choices in this chapter. The panels in the opening sequence took a lot of work and research and are wonderful. Everything about the panels, from the fashion to the setting, are era perfect. His mastery of faces helps in the later half of the book, selling the emotions of Baal and Persephone. Even without the words, a reader could tell what each character was feeling just from their facial expression. Wilson’s coloring throughout the book is great, but it really stands out during the second part of the book. He uses the coloring to set the mood. The main color he uses is red, giving the whole thing a bloody, grisly feel. The flashback of his explanation is tinted a grainy red, adding to that effect, and when he describes when his actions took place, it’s on full red pages with a subtle white grain, as if massive amounts of blood have stained something pure. It’s haunting and wonderful. This one gets off to a slow start, but it makes up for that quickly. Gillen and company drop bombshells on the reader, while also using the way the visuals are presented to play with their subconscious and how the reader perceives what is happening on the page. Wic+Div continues to be one of the best books on the market, and it does it with bravura storytelling and art. Gillen, McKelvie, Wilson, and Cowles are a creative team that has perfectly gelled and are putting out a book that should go down as one of the best the medium has produced.